This is just another example of celebrity rock stars engaging in a cause that perpetuates negative stereotypes of Africa and its people by whitewashing complex events into feel-good consumer moments. Once the recording begins, we, like them, do not leave the studio. The camera remains focused on the artists, showcasing them throughout the session in a pastiche of grainy images. For 3:40, the pop stars do what they do best, entertain us, and by the end when they all stand shoulder to shoulder and sing the refrain “feed the world” (with one musician recording the moment on his cellphone), the opening image of the Hazmat men and the sick African woman has been forgotten, replaced by this sanguine homage to these artists and their efforts to raise money for West Africa’s fight against Ebola. And raise money they have. In just a few days, Geldof’s new version of the song has amassed millions of dollars—minutes after it was released it raised more than a million British pounds. While some see this as a good thing, there are many who see it as an another example of celebrity rock stars engaging in a cause that perpetuates negative stereotypes of Africa and its people by whitewashing complex events into feel-good consumer moments. How can we not spare $1.29 for this sickness that threatens our very existence? How can we turn a blind eye when these musicians sing movingly of an African continent where, as the lyrics tell us, “there is no hope” and “there’s death in every tear”; where “fear” and “doom” prevail; and where now an incurable disease may infect their senses, rendering them incapable of knowing it’s Christmas. Give. Now. Please, give, is the urgent, critical message. And we do, many of us willingly and without question because we want to help, because we’ve seen the harrowing images taken by journalists of the suffering, sprawled on dirty floors, their eyes, vacant and open and bleeding; we’ve seen the dead lying beside the dying, being sprayed with chlorine and then left to rot. But buyers beware: The click of the button will not let the “infected” African nations know that Christmas is coming (with millions of Christians in Africa, it’s safe to say, they know that Christmas will be here), nor will it make the virus go away or ensure that proper infrastructure is immediately built. He is right. Africa is not a barren wilderness, filled with “dread and fear.” In fact, it’s a place teeming with growth, where agriculture is the most important economic activity, employing two-thirds of its working population. It also has its own educated, wealthy, and upper middle class. But none of this matters to Geldof, not the lyrics, not their deceptive and undermining message, and certainly not the reality that Africa is a very big continent and Ebola has affected only a small portion of it. All of that is incidental to him who sees himself as some self-appointed Messiah, who believes it’s his mission to save the West African nations from Ebola by sending them envelopes of money with Yuletide wishes garnered from his aging Christmas song. Yes, buy “this thing,” this neatly pre-packaged set of lies about a continent and its people to help in saving us, as Geldof put it, from “this…foul little plague.” And if you decline to do your part in his bid to stop the “little plague” from spreading then be prepared to undergo a similar public shaming as Adele, whose silent refusal to participate was snubbed by Geldof: “Adele is doing nothing…not answering the phone…she doesn’t want to be bothered…Some people just don’t want to do it.” What Geldof didn’t tell you is that Adele has already done her part by making a private donation to Oxfam’s Ebola Crisis fund. But for Geldof, who also called out the German government for not “doing enough” and for being “laggards,” the taciturn donations don’t matter, because the measure of worthiness and caring has become one full of pomp and ceremony, one that is disconnected from the reality of the cause. Just recall the opening sequence of the song’s video where the image of the sick African woman being carried away was superseded by the parade of rock stars entering the studio under a salvo of paparazzi flash bulbs. Yet some might argue, Geldof has been wildly successful in raising money (and a lot of it) for his new cause, so it’s excusable that his lyrics are trite and erroneous and that the sick woman in the video was there for shock value. But actually, it’s not OK, and it should never be OK because this very system of justifying and pardoning celebrities (rock star or other) for their exploitive and ignorant behavior when endorsing a cause has created a culture where money trumps ethics and where dignity in giving has been lost. I wonder how many musicians who participated saw beyond the immediate goal “to sell a lot of singles, raise a lot of money” and thought about the lyrics that they were being asked to sing and package for the world. I wonder if Dan Smith understands the implications of his line “where a kiss of love can kill you?” And if Seal, who follows on the heels of Smith, really believes that “there’s death in every tear” an African person sheds. On Christmas day, will One Direction even think about the Ebola-affected West Africans? Whether or not any of the musicians took stock of the words coming out of their mouths is now a moot point—they are out there for the world to hear, buy, and maybe believe. From the first time Geldof released the song in 1984 with a top-notch cast of coiffed rock stars that included Paul McCartney, Boy George, Duran Duran, George Michael, Sting, and Bono among others, there were problems with accusations of self-indulgence and racial stereotyping—the cover art of the single featuring starving black children standing against a backdrop of happy white children celebrating Christmas said volumes. 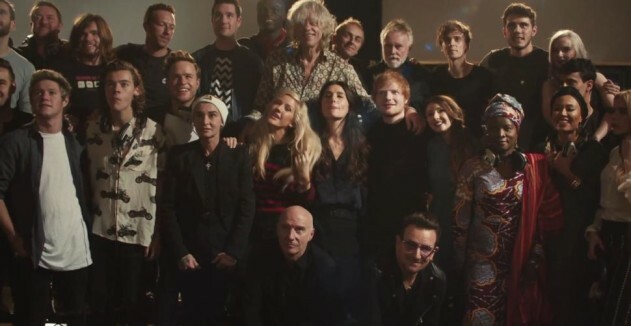 But, like its 2014 counterpart, the song raised money and earned Geldof the Irish equivalent of knighthood, suggesting that it was perfectly acceptable for him to portray the entire African continent as a starving people, with flies buzzing around their heads, passive and poor and helpless until Western rock-stars swept in and fed them. Now, 30 years later, Geldof has chosen to resurrect a song he admitted was one of the “worst songs in history,” to once again save the helpless Africans, who this time, are not starving, but rather lying sick, swatting flies in filthy medical facilities racked with Ebola-ridden patients. It should come as no surprise that everything about this updated version of the song from its shoddy video to the mildly altered lyrics underscores one thing: We are a culture awash in quick fixes, “band aids” that don’t actually solve the problem but in many ways make it worse. What West Africa needs to fight Ebola is medical personnel and infrastructure, not another hackneyed version of a dime-store Christmas carol—passed off as some kind of redemption song—that may raise money, but that will also turn a new crop of celebrity rock stars into modern-day saviors. Maria Smilios is a writer living in Astoria, Queens. Her work as been published in Narrative.ly, Literary Mama, Feministing, Killing the Buddha Blog, The Grub Street Free Press, and Queens Mamas among others. You can visit her at http://www.mariasmilios.com.